Thanks for everyone's support on my digital photography workshop so far, I will have another 1 day very intensive digital photography introduction class on 6/21 Sunday. A brief description of what the workshop about.... 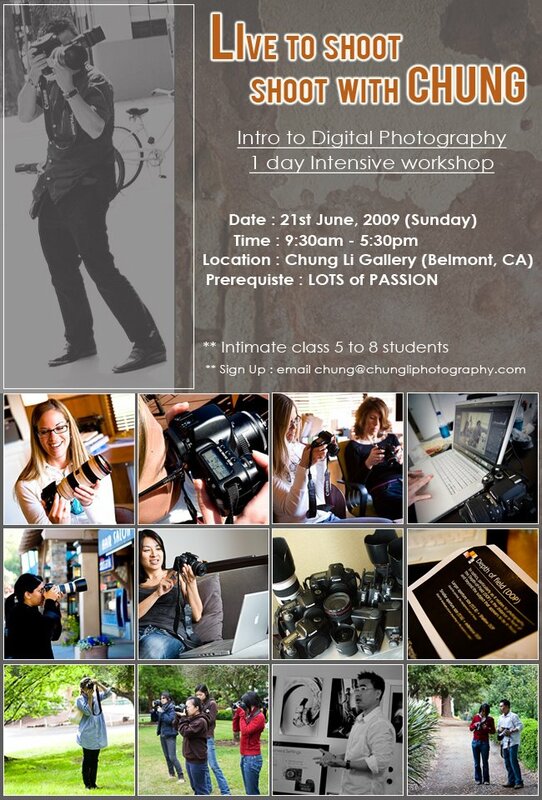 It is a 1 day class (9:30 - 5:30pm) on Sunday 6/21 at my new photography gallery / classroom located in Belmont . This introduction to digital photography class is designed for student who has little/or no experience on using a DSLR ( Digital Single-Lens Reflect camera ) or a beginner in photography. It is an intimate class for about 5 - 8 students , we want to keep the class small so that everyone has chance to ask questions and interact, don't we all hate the boring traditional classroom learning environment ??? We all want to learn in a fun and relax way. Class starts from 9:30am , will have a break and we all go out for an hr lunch and then class ends at 5:30pm. Former students were all surprised how much they learned in a 7 hrs intensive class with me and it is a real jump start for them. 2009-5-3 Chung Li Workshop, what a fun day.